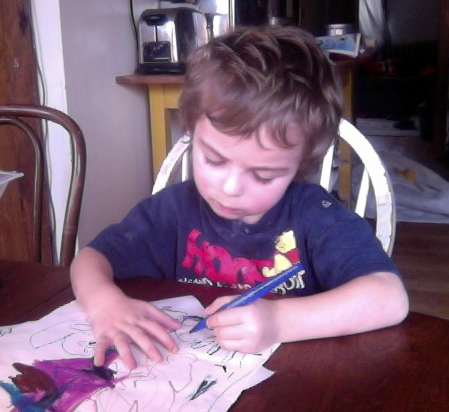 Aidan at work on his magnum opus. My children are ever so much more productively writing than I am. Vincent’s discovering the discoveries and challenges of reading and writing, and Aidan is doggedly working on his own mysterious pages. I, on the other hand, have written exactly two poems since my mother died. That Salamander will be publishing one of them in their next issue is some consolation, but I’m feeling the pull and tug of the writing bug. After Aidan was born, I buckled down and wrote a poem a week, and kept at it consistently, for a long time. Not all were worth keeping or working on, but the regularity of effort kept my mind chugging. I’ve reached that stage where I’m weary of talking about my grief. I miss her. It hurts. Nothing helps, nothing will help, because she’s not coming back. Emotionally I accept that, but I’m just bored with myself. I’m not unaware of my life’s many blessings, not least of which is a plenitude of love, my dear family, this unexpected gift of a new child in the spring. I’m also grateful that I live a life saturated in literature: Tupelo Press, the Collected Poets Series, the support and love of poet friends — it’s a financially precarious life, but I love it and am thankful for it. Which is to say, I love my life. To paraphrase the film, “Super 8,” (which I also loved), bad things happen, but I can go on. I can live, and can live happily. I guess I’m just trying to find a way to write about this abiding sadness that doesn’t feel maudlin or self-indulgent or tedious. It’s one thing to bore myself; it’s unforgivable to bore others. Between last week’s food poisoning drama and today’s improved health, there was a miscarriage scare and days of bed rest. I am grateful beyond reckoning to be on the other side of it, and for my dear friends who helped me through those days. 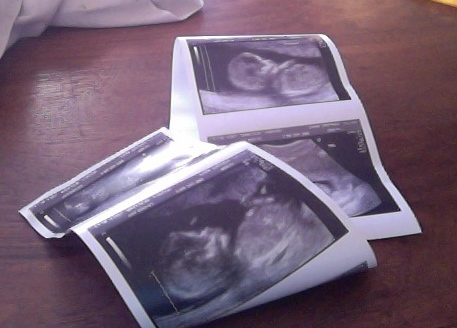 The baby’s heartbeat, its speedy little whir, is the most reassuring sound in the universe. Victory has to be rare. It is the unicorn of all endeavor. and I fail. I fail and I fail and I fail.